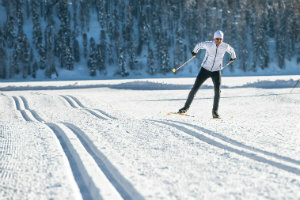 Conditioning for Cross Country Skiing | Podiatry Associates, P.C. Ahhh…winter in Colorado. From downhill skiing and sledding to ice skating and snow shoeing, Colorado’s got something for every winter activity lover out there! No matter what your exercise of choice is, though, it’s important to warm up properly so you reduce your risk of injury. Cross-country skiing is no exception. Before you hit the trails, get prepared by doing these warm up and conditioning exercises that will ensure you glide through your day smoothly! Ankle rotations – circle each ankle in one direction and then the other. Side-to-sides – place your hands on your hips then swing them left then right. Now place your hands on your knees and swing them side-to-side, too. Twist and roll – with arms extended out to your sides, twist from the waist back and forth. Now roll your shoulders frontward then back. Leg Swings – standing on one leg, swing your arms and opposite leg frontward, then backward, then out to the side. Switch. Squat and jump – do a one-legged squat, then laterally jump to the other leg and squat. Repeat. Lunges – take a large step forward, front leg bent and back leg extended behind you. Get as low as you can and keep your knee behind your toes. Alternate. Now, get on your cross-country skiing gear and head on out for a great day on the trails. Enjoy! If you have any questions, would like some more tips, or need to make an appointment, you can use our convenient online contact form or dial (303) 805-5156.